Written for J.R.R. Tolkien's own children, The Hobbit met with instant critical acclaim when first published more than sixty years ago. 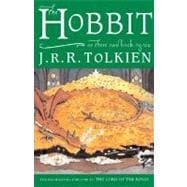 Now recognized as a timeless classic with sales of more than 40 million copies worldwide, this introduction to Bilbo Baggins, Gandalf the Wizard, and the spectacular world of Middle-earth tells of the adventures of a reluctant hero, a powerful and dangerous ring, and the cruel dragon Smaug the Magnificent.